(BGP) 25 tracks (54:31) 1965-1973. 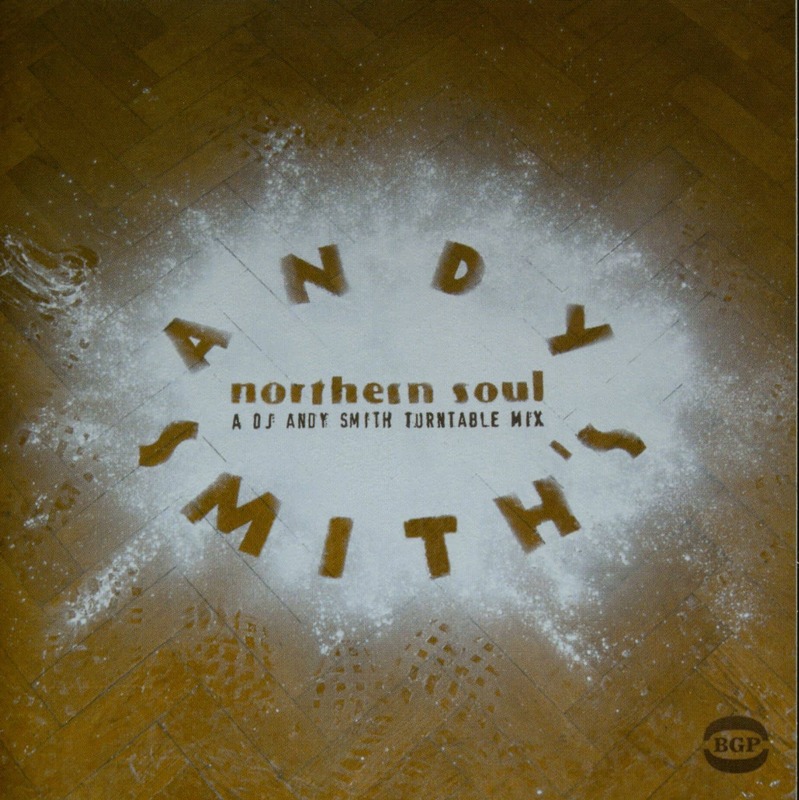 So, why is DJ Andy Smith putting out a Northern Soul mix? Well, that's what a lot of people ask me and the answer would have to be that - it's fantastic music that I've been collecting for a long time. People that go to my gigs will know that I like to include Northern Soul in my regular DJ sets and this is a project that I've wanted to do for a while (along with the Northern Soul night that I am currently running at the Jazz Cafe in Camden Town, London). After having touched on it on my last official mix CD, "The Document 2" (containing Can I Get A Witness by Barbara Randolph and Boogaloo #3 by Roy Lee Johnson & the Villagers), I figured it was time to go the whole way, and thanks to Adrian Gibson at the Jazz Cafe and Dean Rudland at Ace Records, it's come to fruition. 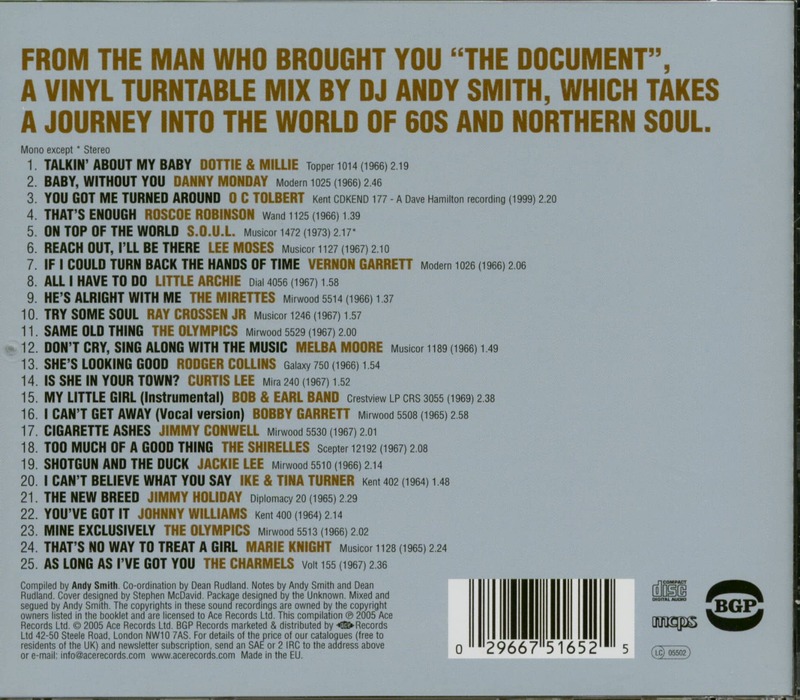 I guess I first became aware of Northern Soul through digging for records with my portable turntable, finding great tracks that I never previously knew about (apart from enjoying playing Motown and Stax records in the very early days as a teenage mobile DJ of course!). And once that whole world of collecting Northern is open, it's a never-ending list of titles to obtain on 7" 45s (although I personally don't mind a reissue if it sounds good, so that helps financially!). I also figured that more people should be aware of this great music. I thought I would use what profile I have to push this music to listeners that would not normally investigate it. The feedback from the nights at the Jazz Cafe seems to prove that this is happening, which is really encouraging! Of course, there are probably the purists out there who wonder what I have got to do with the "scene" and don't see it necessary to mix tracks together as they are perfect in there own right. I agree to an extent but I feel it's also about putting forward the identity of the selector/DJ a bit more. I often think that more of the inspiring DJs from the golden era would be more well known now if this had happened in days gone by. I for one would buy a CD of a night at the Casino or The Twisted Wheel and would have marvelled at the DJ's selections and announcements. Anyway, the music on this disc is timeless and always uplifting. I'm happy I've managed to get some of my favourites on here (thanks to the extensive Ace back catalogue). I know that the Charmels at the end isn't strictly Northern but what a tune! (Even forgetting the Wu-Tang Clan sample on the intro.) Remember - great music will last forever. Hope to see some of you down the Jazz Cafe at "Andy Smith Presents Northern Soul". 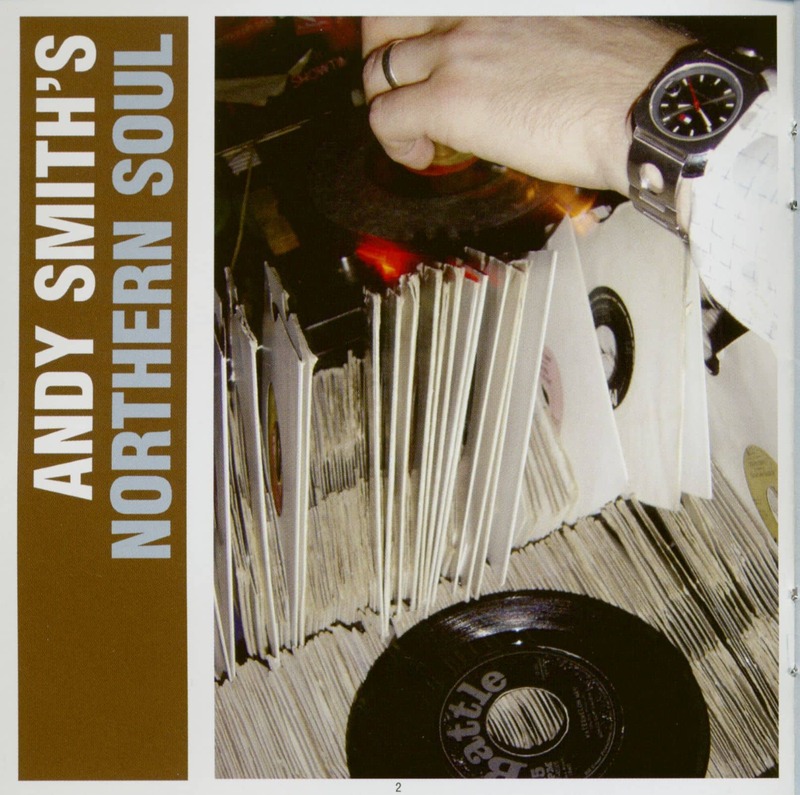 Customer evaluation for "Andy Smith's Northern Soul (CD)"
14 Is She In Your Town?